Over the last 36 years of running this company, I've learned one thing is for sure, BIGGER is BETTER! 1. This Stainless Steel Deluxe Vault Door starts off with a 1 ¼” Solid Stainless Steel Plate that will easily stop any cutting torches and armored piercing 30-06. 2. 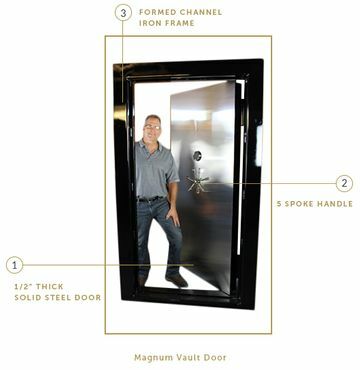 The cool part is the Crane Hinge door not only looks cool but it moves the door out of the way for a clear opening of 38 inches, unlike normal hinges where if you don’t have room for the door to swing 180 degrees. Additionally, the crane hinge makes for tighter tolerances that you can’t get with normal hinges. 3. This unit comes with a formed 3/8 inch Stainless Steel channel iron, once again cutting torches cannot defeat it. 4. 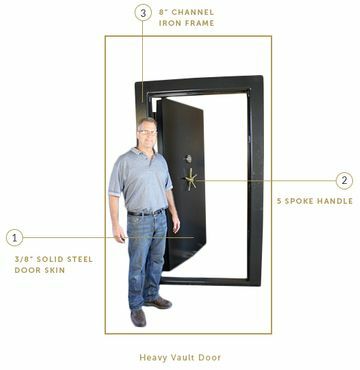 This door is an outswing door, insuring available for additional cost. 5. 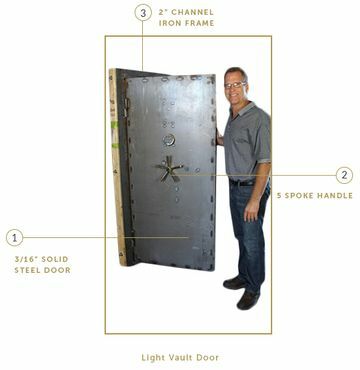 This vault door comes with 12 active plungers that are made out of 1 ½” diameter Stainless Steel. 6. 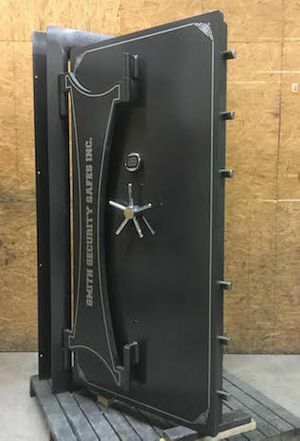 The door and frame will be painted a textured black paint to hide the stainless steel making so no one will know it is Stainless Steel. 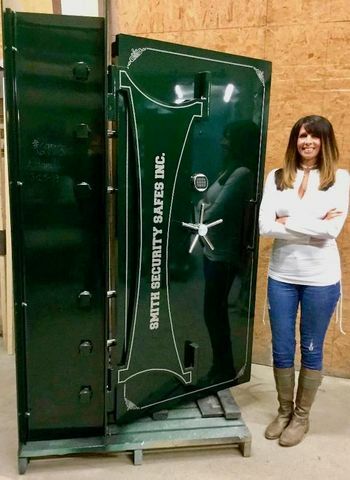 Most break-ins are inside jobs and they will not know it is stainless and will not be able to defeat the door. 7. 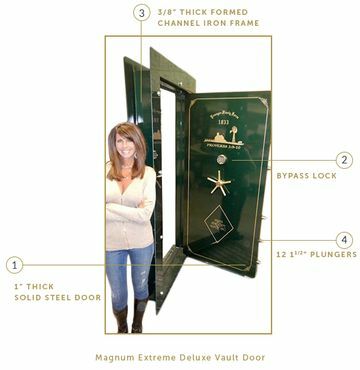 This door comes with an inside handle so you can lock yourself in or you can get out from the inside. 8. The EZ installation is the outside flange that you slide the door in the opening against it, giving it that finished picture frame look. 9. 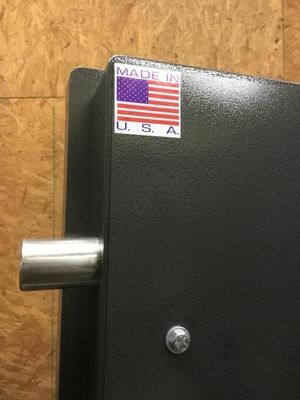 The full inside flange is bolted to the inside of the frame, securing this door into place. It also seals off any gaps making it much better for the fire rating. This flange is more secure than the Z brackets and gives it a finished look. 10. We will drill holes in the full inside flange so you can secure it to the inside wall for extra security, we will supply the bolts. 11. Next, we’ll line it with Ceramic Fiber giving it a 5 hour and 30 minute fire rating. 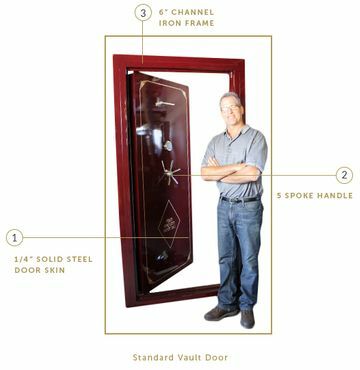 We also added an expandable fire seal so when it gets hot, it’ll expand 6 times it’s normal thickness sealing the door. 12. We add plunger covers incase you would like to fill the cavity with concrete or insulation without plugging up the plungers. 13. A thermal re-locker is a device that if they tried cutting this door with a cutting wheel it will lock it down tight. We give you 2 thermal re-lockers. 14. Honey Comb is where we use ¼” x 2” strap iron and weld it on its edge horizontally from the top down, then we add some iron going vertical. If they tried cutting a hole big enough to crawl though, they will be there a long time. 15. We add ½” Manganese under the lock so you cannot drill in without special drill bits. More than likely, thieves bring a Magnetic Drill that will not work on Stainless Steel. 16. Roller rods are in place if someone tries to use a Sawzaw and they will not be able to cut rods that roll. Let’s face it, I doubt anyone will try to defeat this door with a Sawzaw but just incase, it’s there. 17. The Bypass Lock is a back up keyed lock, just incase someone hammers off your lock, a fire melts it off, even a malfunction, this key will get us in. This key is coded just for your door and you cannot pick it. 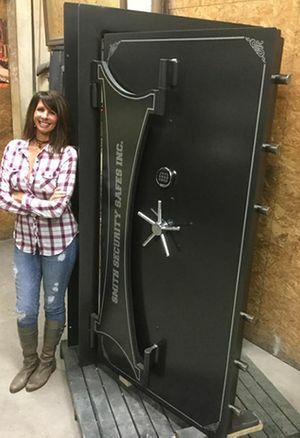 Make sure you hide this key, just NOT in your safe room. Yes, this happens more than you think. 19. We use a USA 5 spoke handle, these handles are superior to the Chinese handles. Available in chrome or brass. 20. 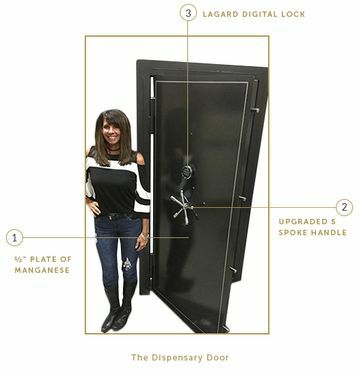 This will come with a LaGard 39-E lock that can be hooked to your security system and is set up with a duress mode. 21. 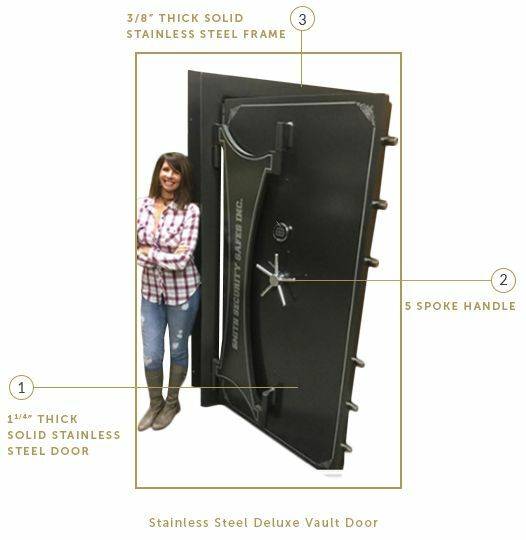 This stock vault door will ship within one week from the time you order it. 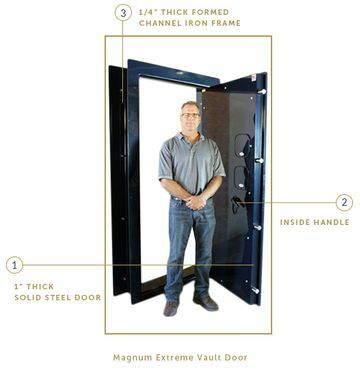 If you order an inswing it will take 4 weeks and custom doors will take 5 weeks. 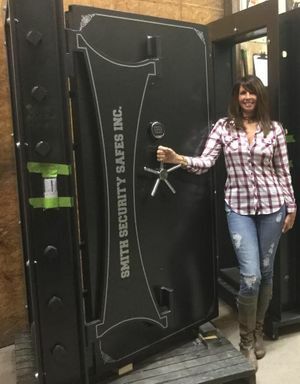 This 3000 lb All American Stainless Steel Vault Door sells for only $12,450!